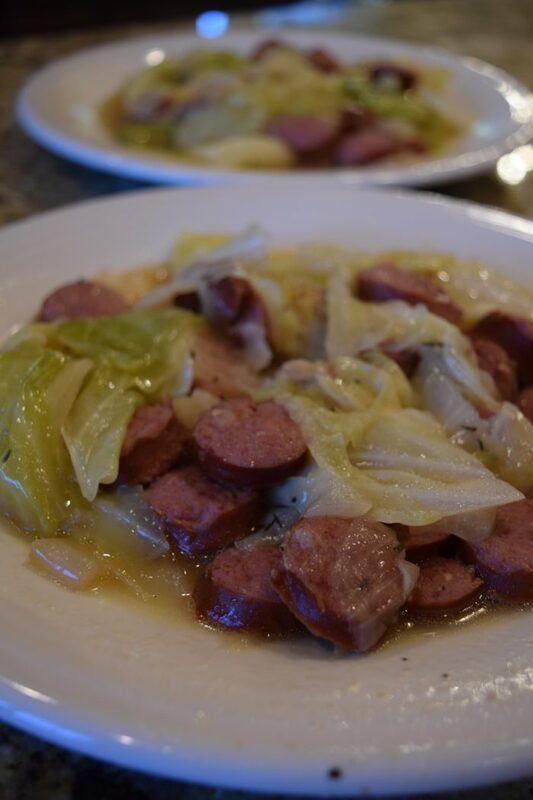 I love cooked cabbage, and I love smoked sausage, especially with onion added, so I thought this Instant Pot cabbage and sausage recipe would be good. And boy was it! In fact, this is probably one of my all time favorites now. 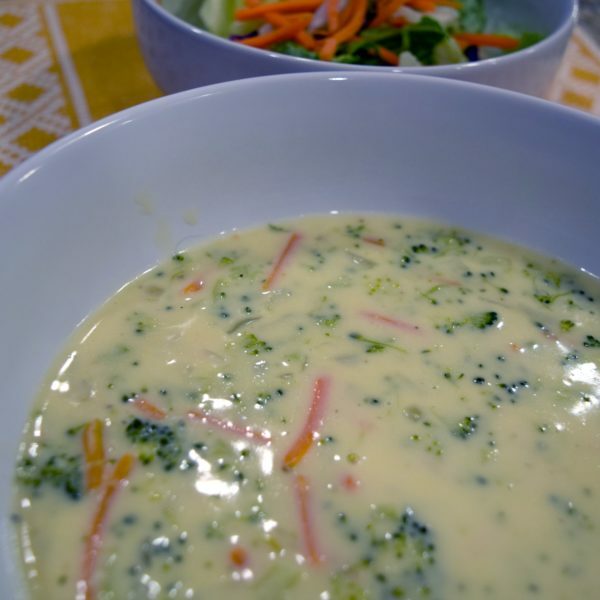 The recipe is quick and easy. 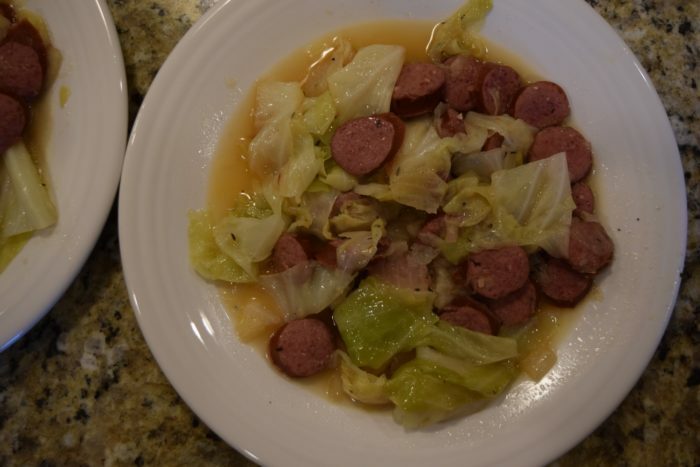 It consists of simple ingredients: cabbage, smoked sausage or kielbasa (either beef, pork, or turkey), onion, beef stock, butter, salt and pepper, and a bit of hot sauce. 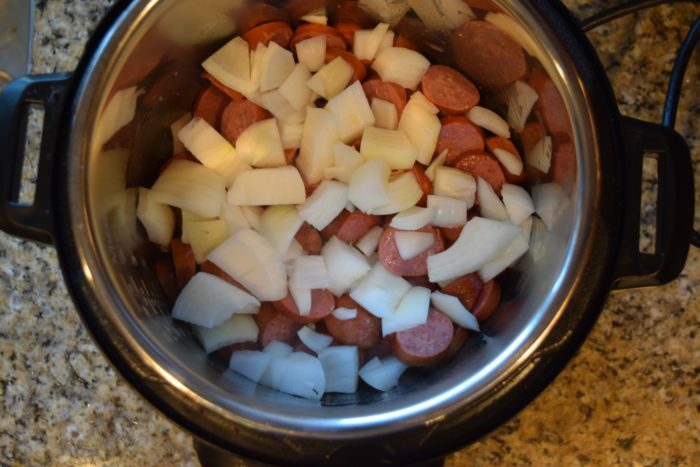 Start off by browning up the sausage with chopped onion in the Instant Pot. Add about a quarter cup of butter to melt after the sausage has browned and add the hot sauce and salt and pepper. 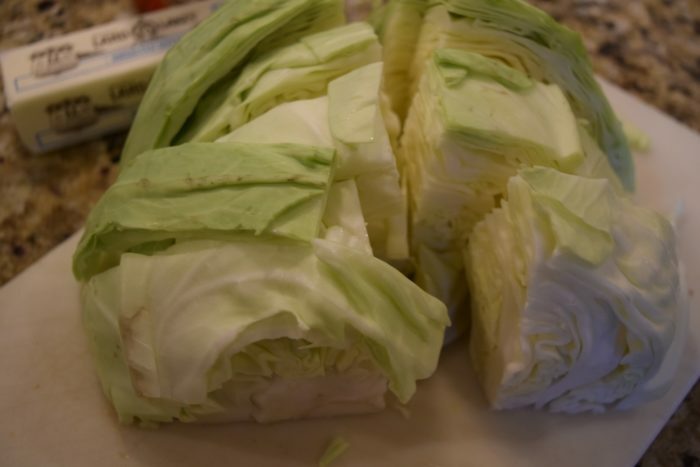 Chop the cabbage into fairly large sections. It will shrink a lot when cooked. Add the cabbage to the pot, making note that you do not go over the max line! Pour in the beef broth. 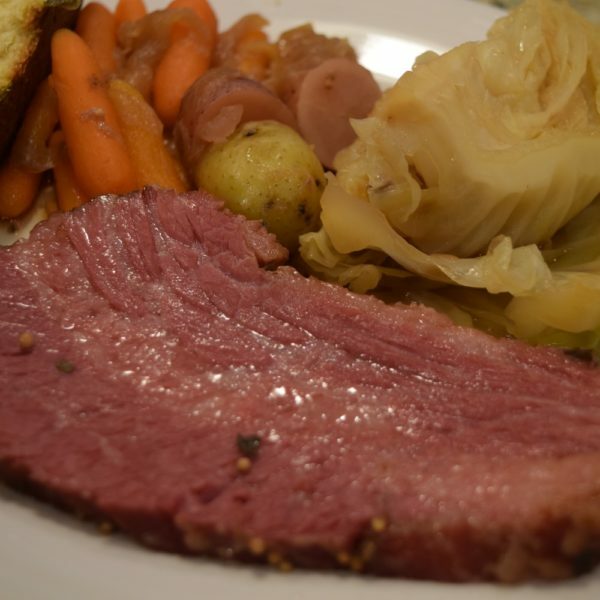 I have seen Instant Pot sausage and cabbage recipes that use up to 2 cups of beef stock for this. That would pretty much make soup! Cabbage lets off a lot of liquid when cooking. I cut the beef stock down to a cup and honestly probably could have used less. But, since Instant Pot says to use at least one cup of liquid when cooking, I stuck with one cup. Plus, I like to have some of the broth with my cabbage when serving. It is also tasty to dip bread in it! For very soft cabbage go as high as 5 minutes. For firmer pressure cook for as low as 0 or 1. I have been doing two minutes for mine. Use quick release. 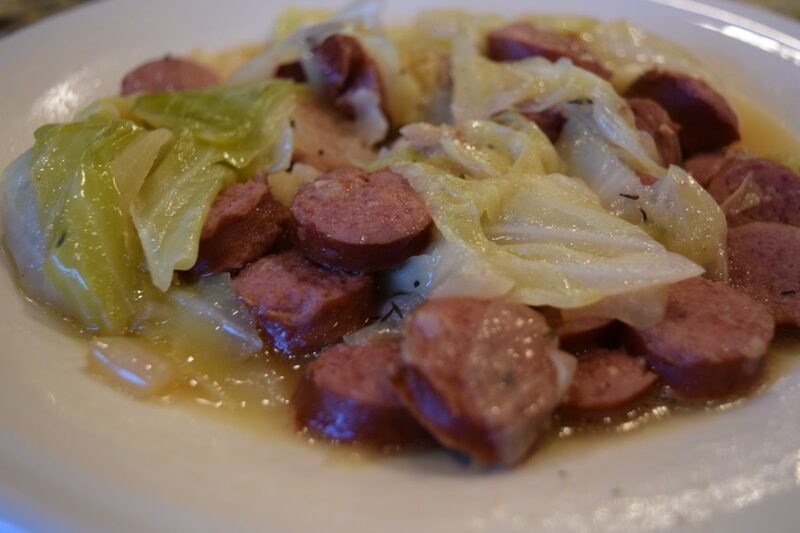 The result is a pretty darn tasty Instant Pot cabbage and sausage dish with a lot of flavor. 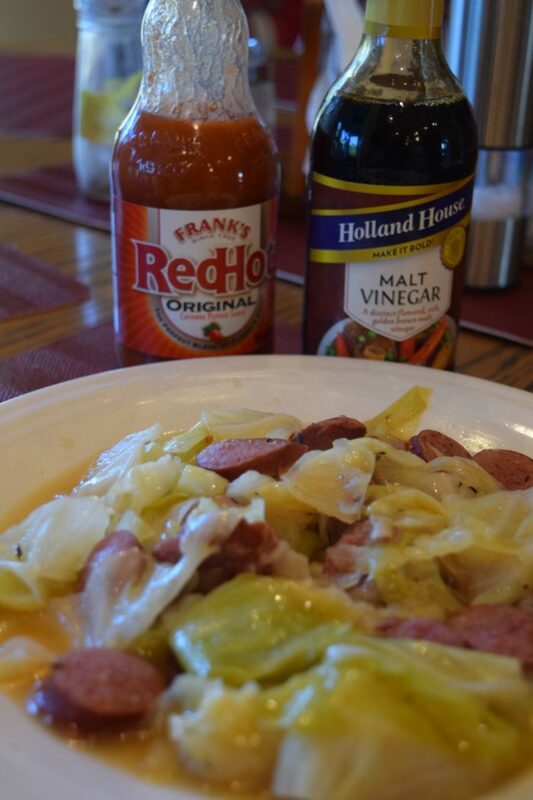 Serve up your cooked cabbage and sausage with some malt vinegar or hot sauce. Yum! 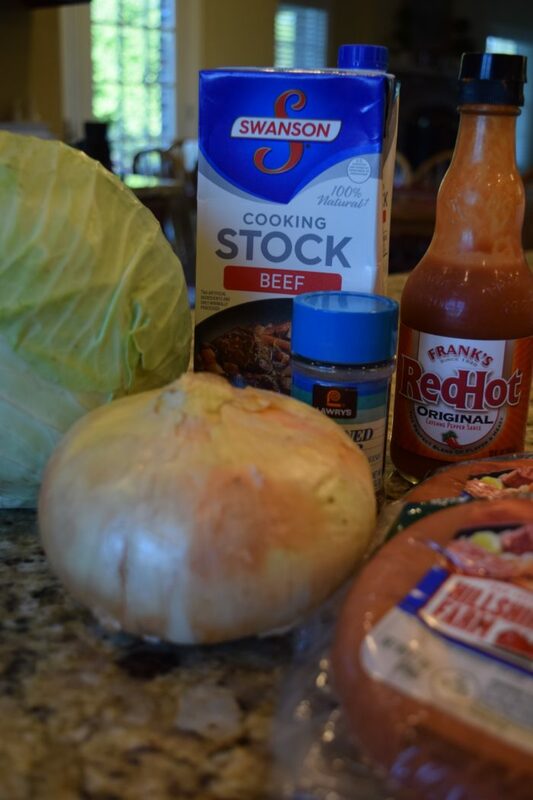 Here is the recipe for cabbage and sausage in the instant pot. You can adapt this for other pressure cookers as well. 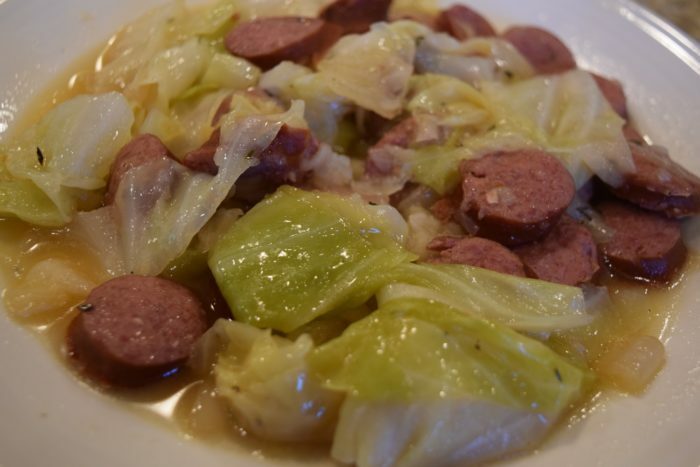 Instant Pot Cabbage and Sausage made with onions, and broth. 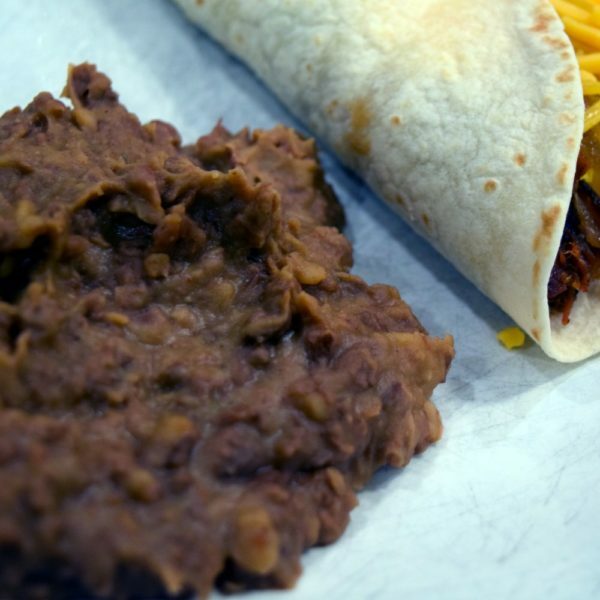 This is an easy a very tasty meal. Using the saute function, cook sausage and onion until well browned, 5 to 10 minutes. Add butter to the pot and let it melt. Stir in hot sauce, salt, and pepper to taste. Add cabbage, do not exceed the max line. Pour in beef stock and stir until cabbage is coated. Pressure cook on manual high pressure for 2 minutes. Use quick release for the pressure. Very tasty! I will say that the cabbage came out overcooked, so I might suggest taking a minute or so off the cooking time (and I did use immediate release). I think I’ll also halve the butter next time too. Having made this a few more times myself, I agree that a minute or two off works just fine! The amount of liquid can also be slightly decreased if desired. Although I like using extra liquid to soak up with some bread. Very good but my cabbage was over cooked also. Good taste but definitely delete a minute or two. Cabbage very soggy. Did high pressure for 3 minutes with 1/4 cup broth and it still came out very soft, which is fine, I was just hoping for a little more crisp. Tasted great just more cooked than I like! I have updated the recipe to pressure cook for 2 minutes. Cooked this up with precooked turkey sausage so no need to sauté first. 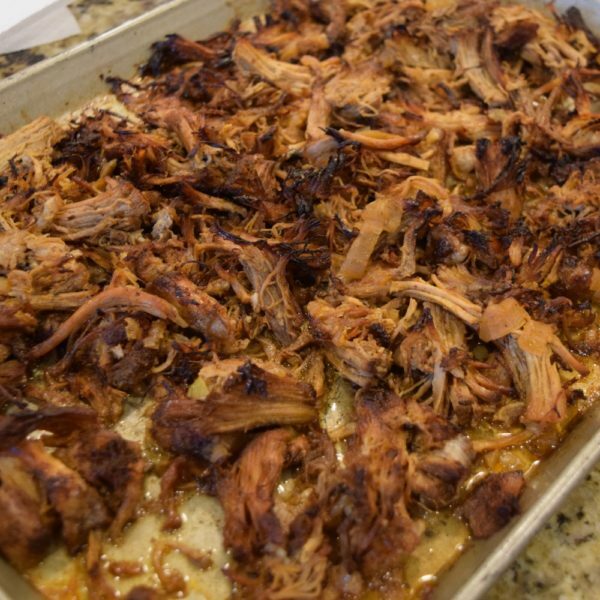 I loved it with the beef broth and hot sauce. My cabbage was very firm so it required 7 minutes of cook time with a quick release. No more stovetop cooking of cabbage for me, this is the only way to go. Thanks for a very good recipe.